Isolated rain showers are forecast throughout the weekend. THOUSANDS SET TO turn out to see Pope Francis over the weekend may want to wrap up well… heavy rain showers are forecast for the coming days. Pope Francis is travelling to Ireland on Saturday for two days to take part in the World Meeting of Families, in which he will say Mass at Dublin’s Phoenix Park and in Knock. It has also been announced that the pontiff will travel up O’Connell Street, Westmoreland Street and Dame Street at around 4.15pm on Saturday afternoon, prior to his speech at Croke Park later that evening. Looking at tonight, however, scattered showers are expected and will be most frequent in the western half of the country. Met Éireann says it will be mainly dry in the east and southeast, with clear spells. Temperatures will range between 7 and 10 degrees Celsius. Tomorrow is set to be cool and breezy, with bright, sunny spells and occasional rain showers, some of which will heavy. Met Éireann says there will be a risk of thunder. Despite the heavier rain forecast, temperatures will be slightly higher than tonight, ranging between 13 to 16 degrees. Other than isolated showers near north coasts, Friday night will be dry with clear spells and light winds. Looking onto Saturday, the day of the pope’s arrival to Ireland, Met Éireann says it will be a fine but cool day with varying cloud and sunny spells. It is expected to be dry apart from the chance of isolated showers. Sunday is forecast to be mostly cloudy and cool with occasional outbreaks of rain. There will be moderate south or southwest winds. Temperatures are due to become warmer next week with dry weather. 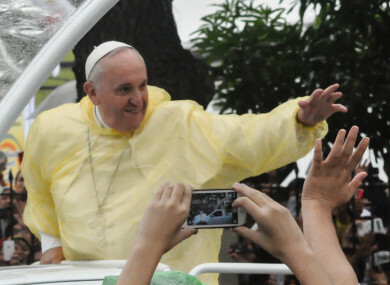 Email “It may rain on the pope's parade during visit to Ireland ... quite literally”. Feedback on “It may rain on the pope's parade during visit to Ireland ... quite literally”.